Members Tricia Curry, Jerri Evans, 2017-18 President Liz Ilgen and Kristin Smith accepting some of the St Pete/Pinellas awards from BPW/FL President Alizza Punzalan-Randle (right). We accepted 10 honors, in total, at 2018 BPW/FL State Conference. Barnie Shuhi Education Award – To the LO developing the best program to extend educational opportunities which stimulate initiative, self-education, or retaining for the members in order to provide new skills and adopt new attitudes. Hortense K. Wells Trophy – To the LO having the best program designed to create a continued overall interest in legislation and government. Red Purse Award – To the LO having the best equal pay day program/event. Eagle Award – To the LO that consistently advocates, educates and informs its members on our 2013/2014 focus issues of economic equity, healthcare, domestic violence and the Equal Rights Amendment (ERA). Public Relations Award – To the LO with the best overall promotion of the year. 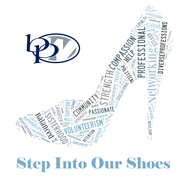 Best Video – As part of the first annual call for videos that demonstrate BPW, our LO won for its “I Am BPW” video submission, a compilation of the faces and voices (members and friends) who make up BPW/St. Petersburg-Pinellas.